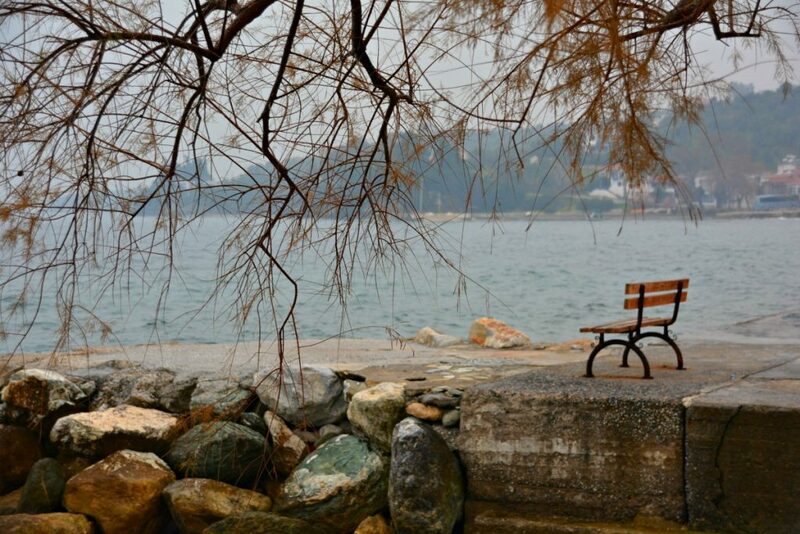 Pelion. With its romantic cobblestone streets, traditional stone cottages, the most incredible ancient trees and picturesque village squares overlooking sea-and-mountain panoramas, you couldn’t ask for much more. Ah, but you can. Good food you say? 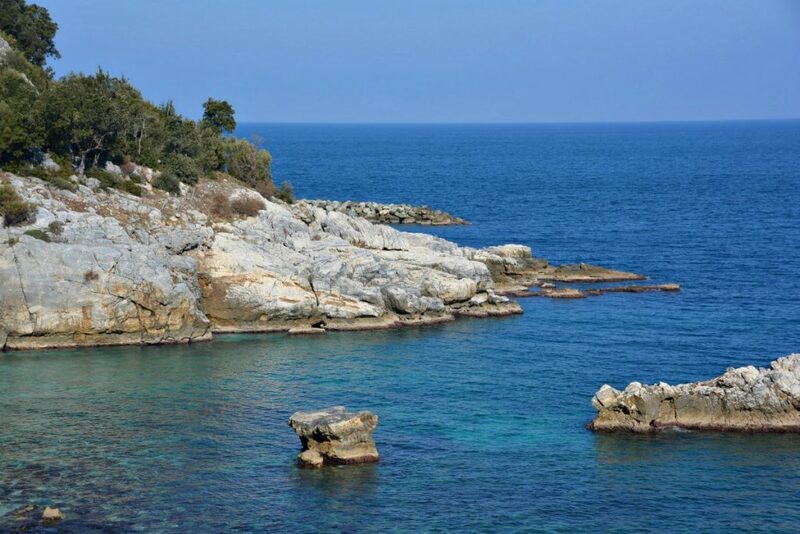 Well, Pelion has all that too. There are some tasty variations on savory pitas, Greek salads, soups and the like. 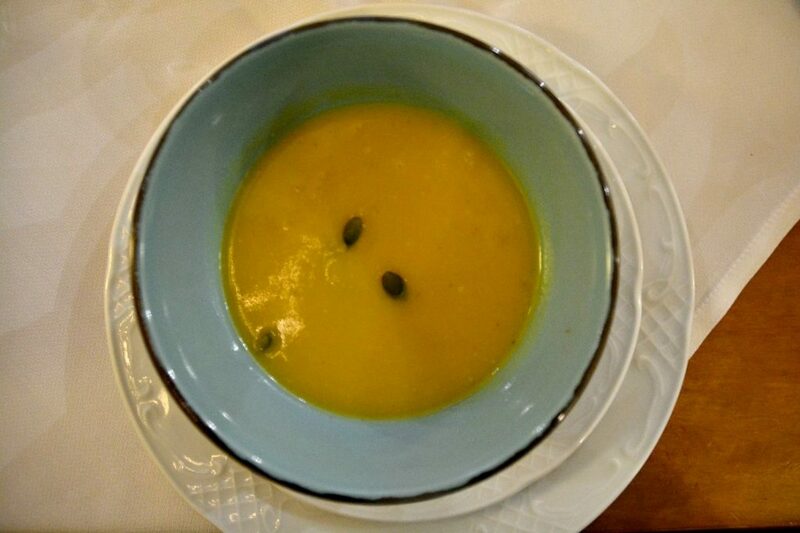 Here’s a list of what to eat and drink in Pelion, wonderful local specialties that will satisfy any foodies reading this post. 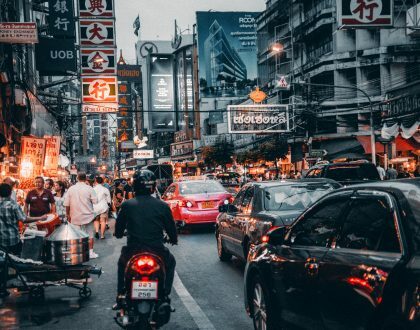 I’ve also included a list of the places to try these delicious local foods at the end of the post. 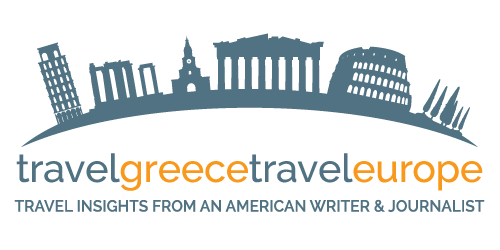 Traveling throughout Greece, I’ve come to realize many regions are fiercely associated with a locally made spirit. 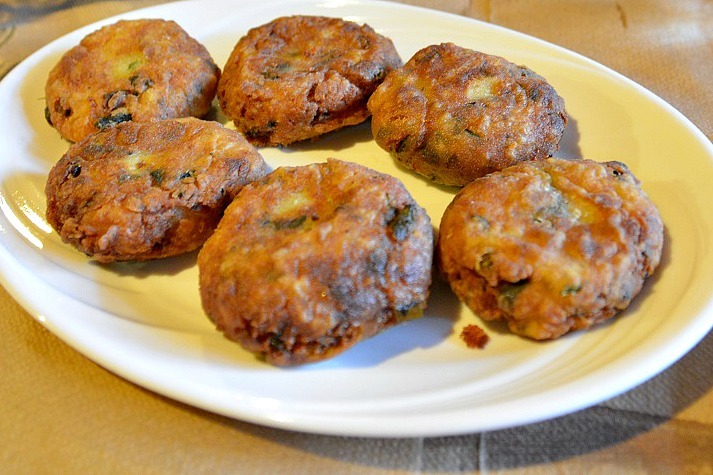 These spirits are much a part of the gastronomy culture as well as a perfect aperitif and a match for local meals. 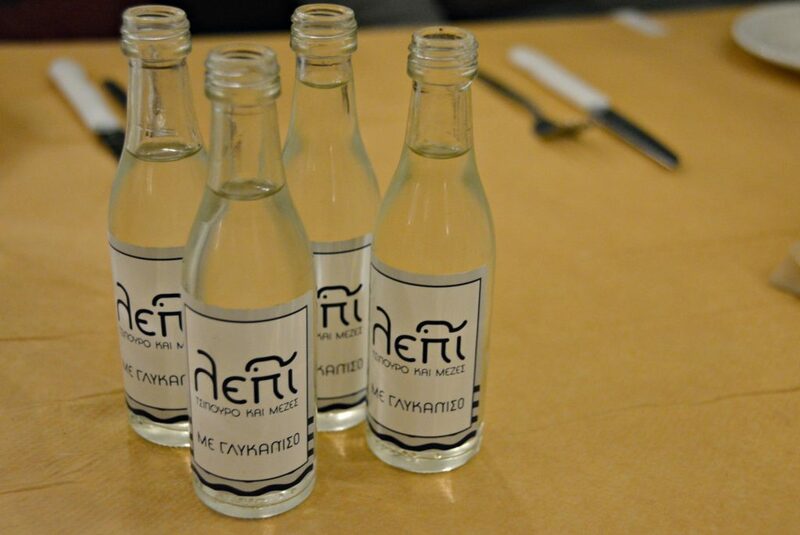 Hospitable Greeks also offer these drinks to guests and friends. 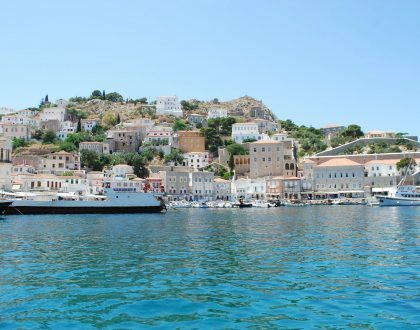 Take kitron on Naxos, ouzo on Lesbos and raki in Crete. 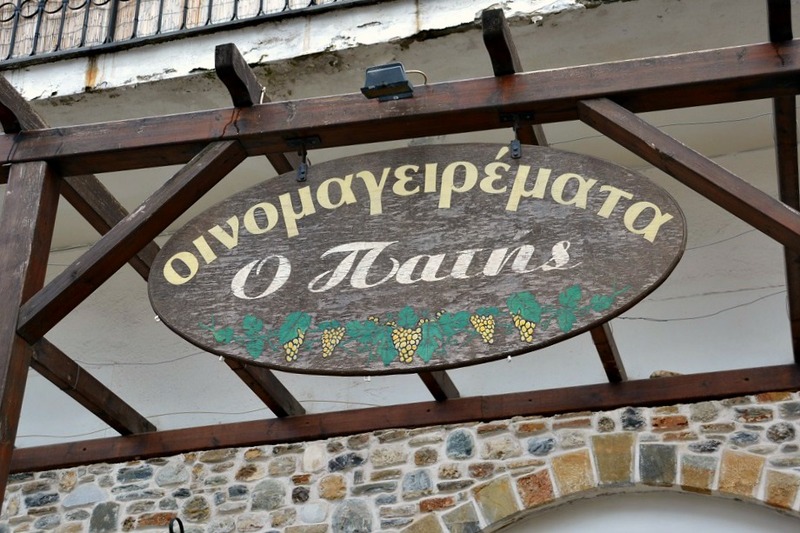 In Pelion, I quickly learned that tsipouro is king. 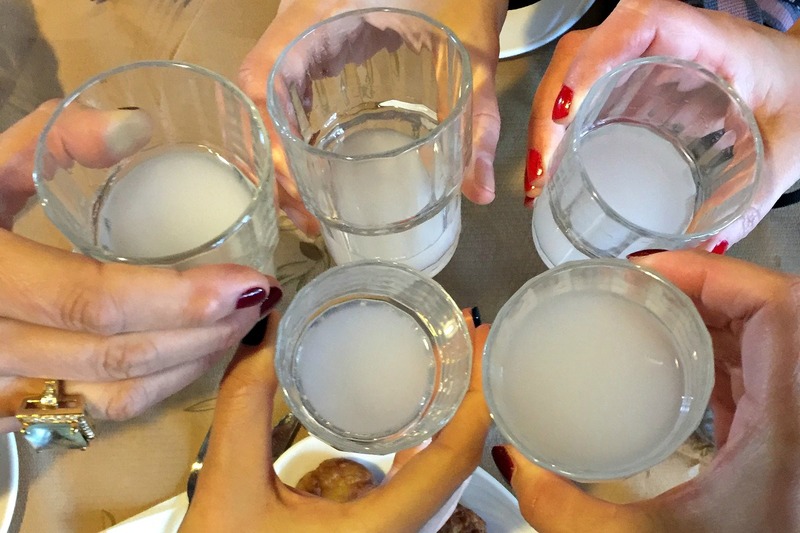 With or without anise flavor, tsipouro is served in a small glass. It can be enjoyed straight, on ice or mixed with water. I’ve even heard the advice to squeeze a bit of lemon in it. It was the first time I tried this amazing vegetable dish of pickled tender leaves and upon tasting it, I had to say, “Wow.” I love how Greeks cook wild greens turning them into the tastiest little meals. 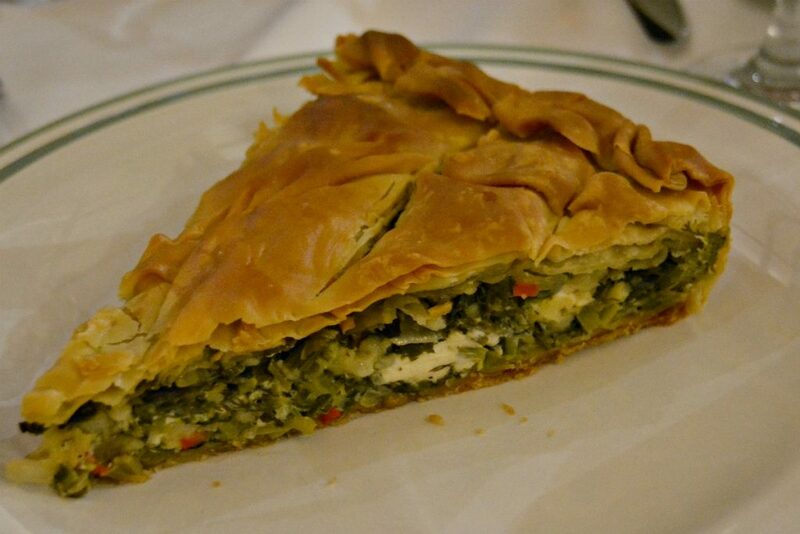 These leaves are from the wild pistachio tree native to Pelion, Athens and Crete. During the springtime, locals pick the green shoots. 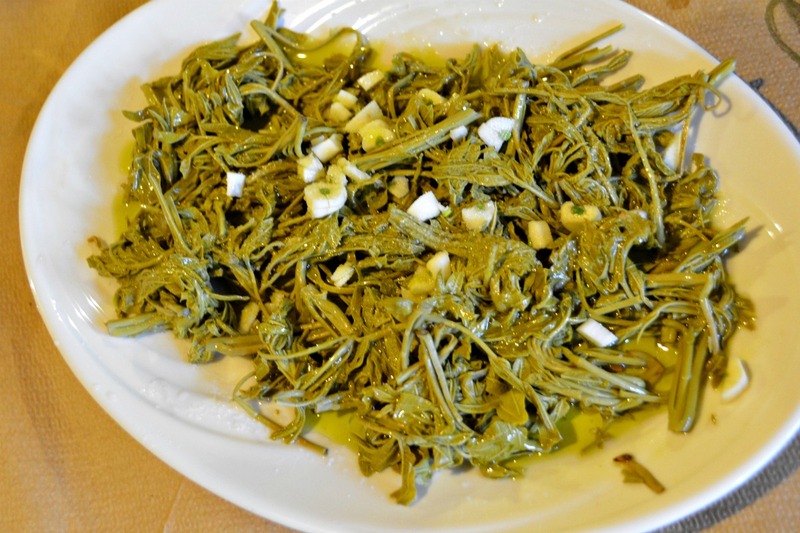 The leaves and roots are boiled and seasoned, sometimes with garlic, to create this fantastic dish. 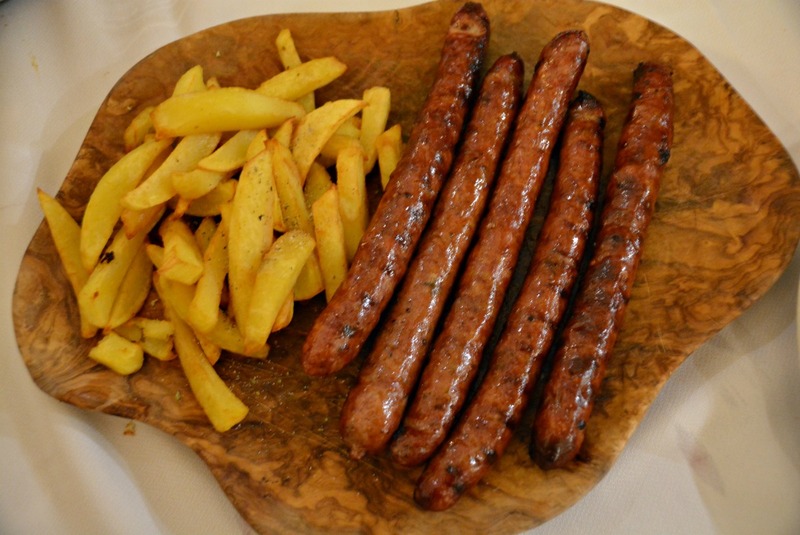 These are oven-roasted sausages served with Greek style potatoes. 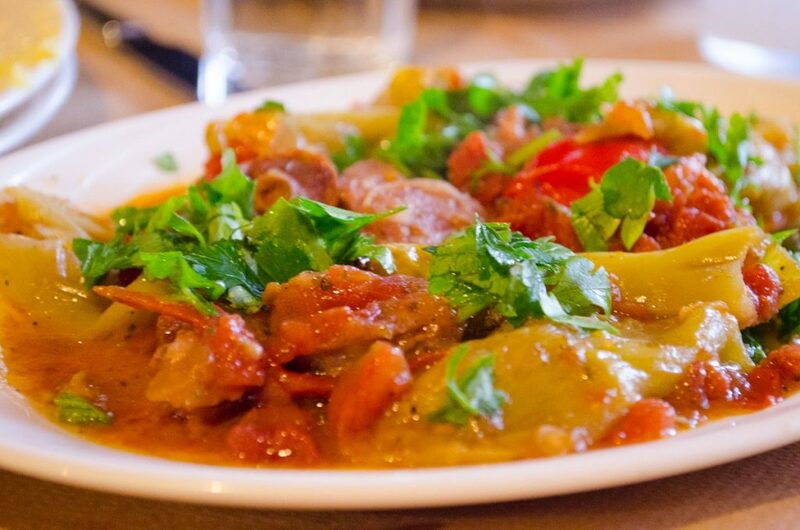 This is local sausage cooked with green and red peppers with a dash of herbs, simmering in a rich tomato sauce. 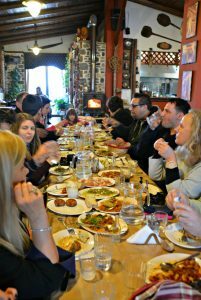 Mezes are Greece’s delicious appetizers, small tasty plates of food that accompany a Greek spirit – shared among company and meant to be enjoyed slowly. 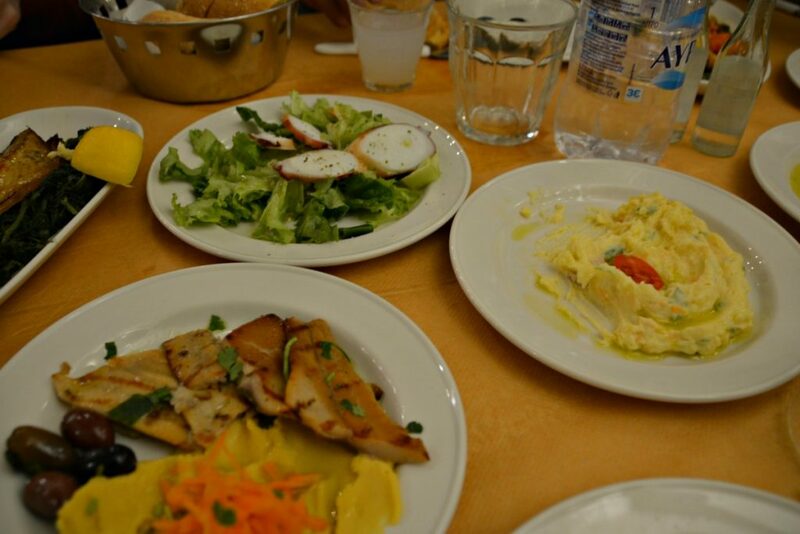 I’ve had my share of mezes over the years but in Volos, I got a surprise. A first! Crab. Yes, the little crustacean is one of my favorite seafood choices. A complicated delight rarely found on menus that reminds me of my childhood. My family used to bring them home alive, kicking in their brown paper sacks from New York Chinatown’s seafood market. My grandma would boil them for a special Sunday dinner. Those were good Sundays! 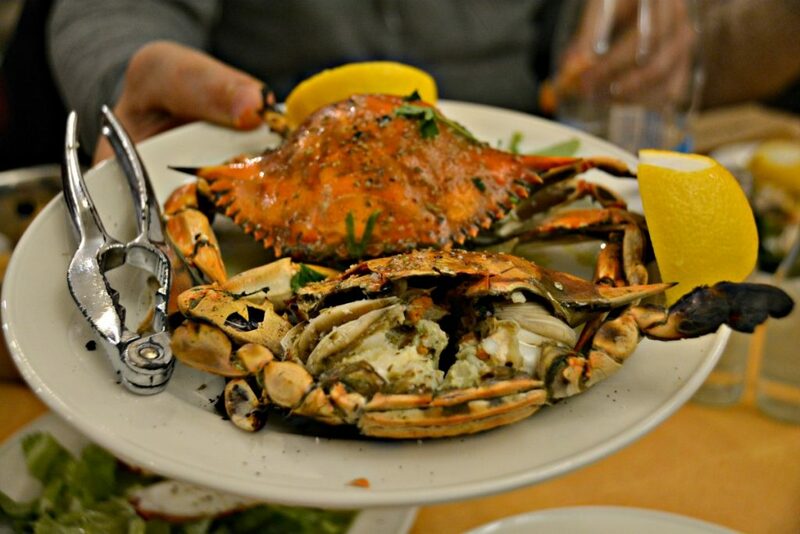 So, there I was with a crab for the first time in Greece – after all these years – and it was delicious. The crab went very well with the tsipouro. 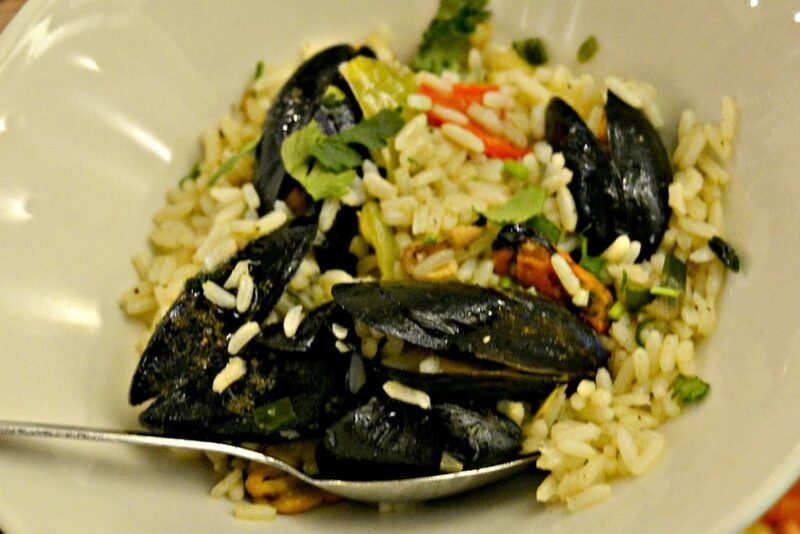 Other mezes you’ll find include calamari, steamed mussels, shrimps and little fried fish. 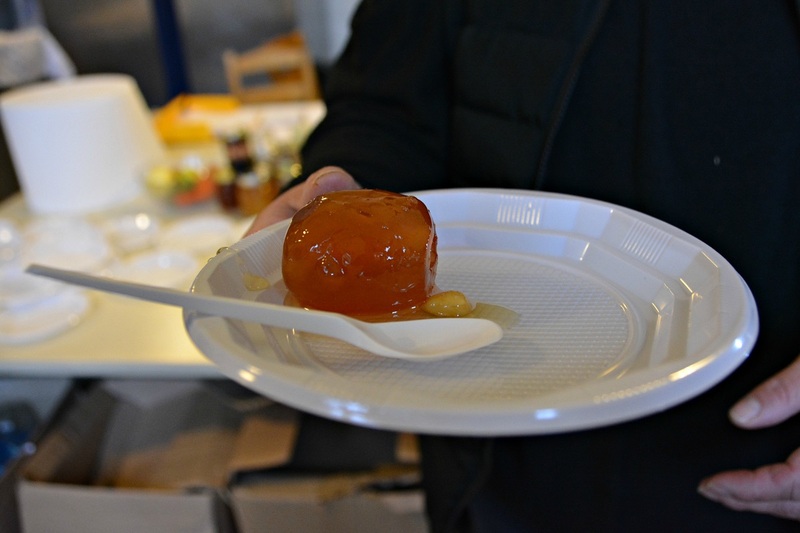 Pelion is known for its fantastic gliko koutaliou which translates to spoon sweets. 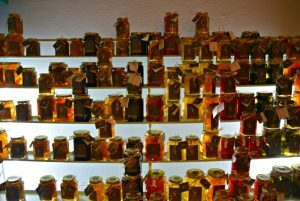 You’ll find lots of shops selling rows of these glass jars filled with what looks like colorful fruit jelly. Popular flavors include apricots, pear and apples. 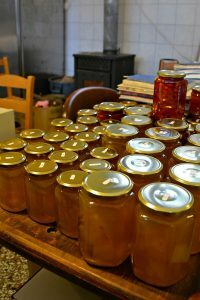 The difference with jelly is that the syrup is thick and very sweet. The pieces of fruit inside is a cross between canned and candied. 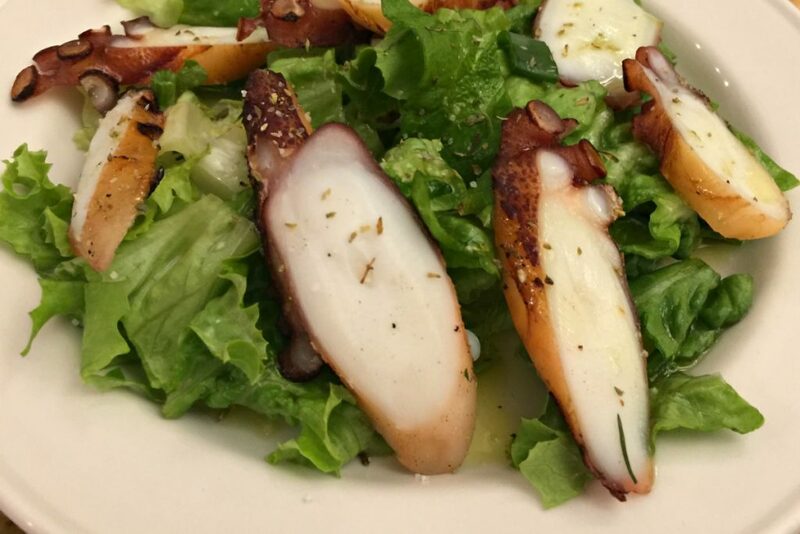 Greek households will serve a teaspoonful to a guest or it can be a nice topping on thick Greek yogurt. 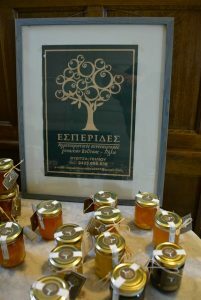 A nice local Pelion spoon sweet fruit to try is fyriki, a cute little apple that is cultivated in the villages of Pelion. 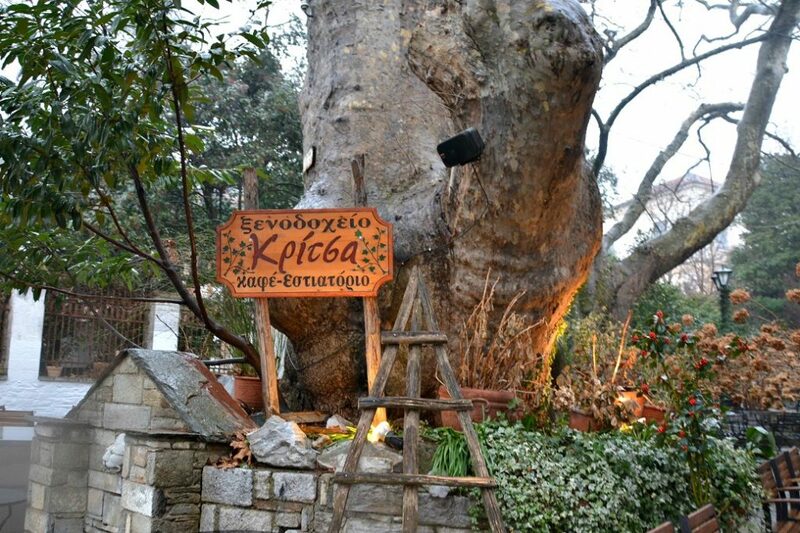 This lovely taverna in the beautiful village of Zagora is known for its fantastic Pelion speciaities. Make it a point to go. This is where I tried tsitsiravla for the first time and an excellent spetsofai. In fact, everything was really delicious. 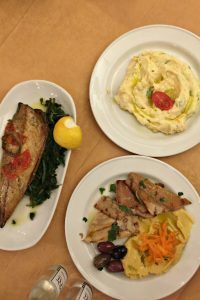 Along the port area of Volos are establishments that make up the “tsipouro district.” Lepi is there and where I had fantastic seafood mezes and excellent tsipouro. I’ll never forget that crab! 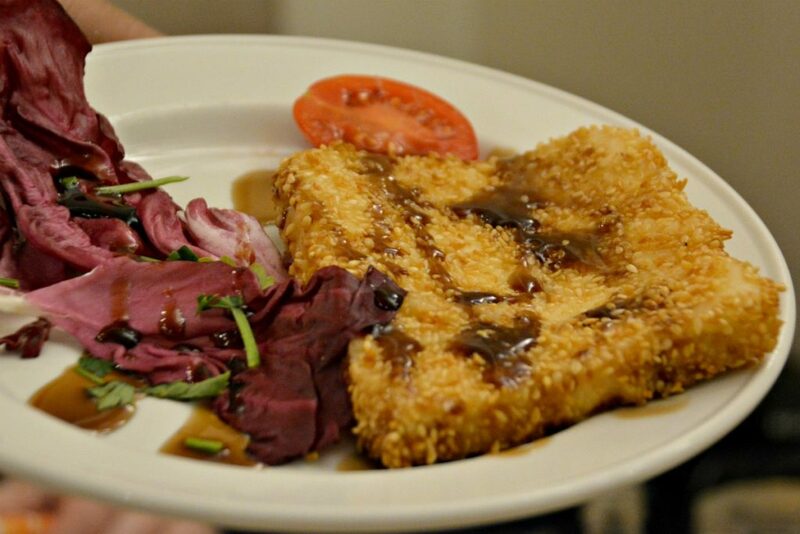 A delicious and memorable meal. 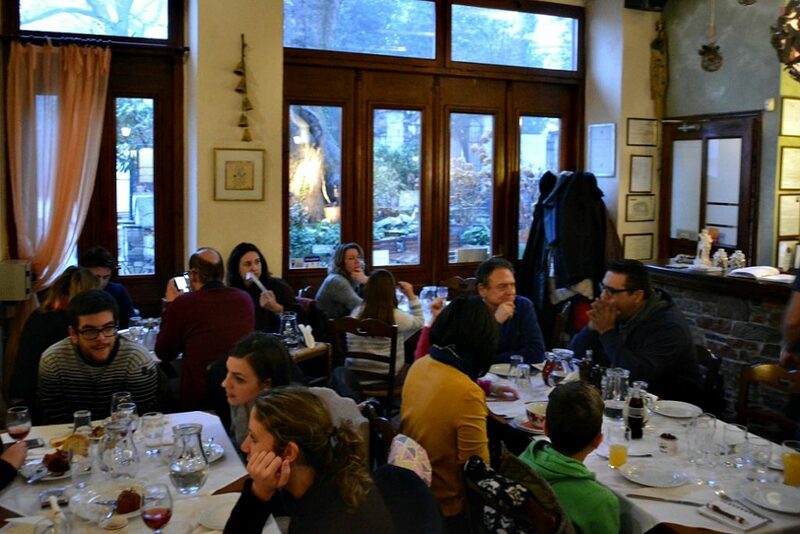 I was particularly excited to dine here because it has the reputation for being one of the best restaurants in the region and one of the best in Greece. 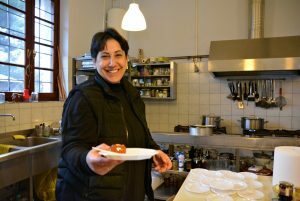 The menu is a journey in local Pelion gastronomy and ingredients are locally sourced, even right from the restaurant’s garden. 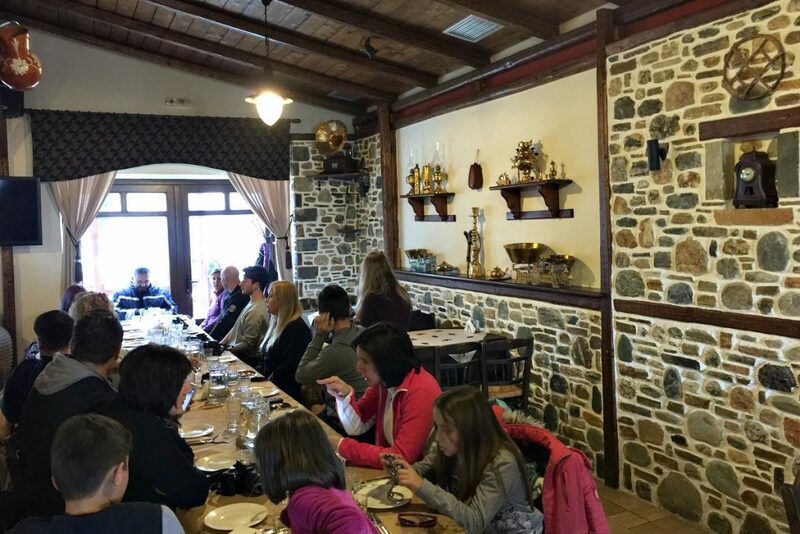 I highly recommend this restaurant for its environment, service and the fantastic gourmet menu that stays true to the heartiness of local dishes from Pelion. 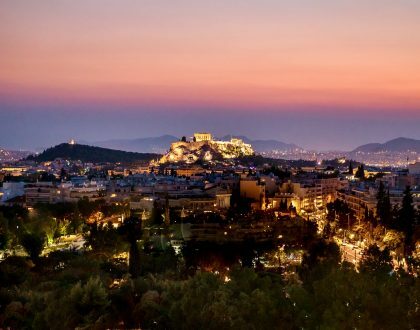 The hotel is also part of the reputable Guest-Inn network of country inns and traditional villas and houses throughout Greece. 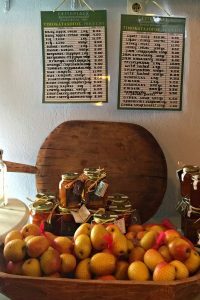 We stopped in a welcoming little women’s cooperative in Vyzitsa where a wonderful selection of seasonal jams, marmalade, spoon sweets and other products are produced with love and care. You can sample many of the products. Definitely support them and take an authentic local food product home with you. I was a guest of the three-star Aglaida Apartments in Tsagarada. All 14 apartments have a fireplace, kitchenette, free Wi-Fi and a view of either the gardens or the sea. There is an outdoor pool and breakfast is included. Standard rates start at 65 in low season. 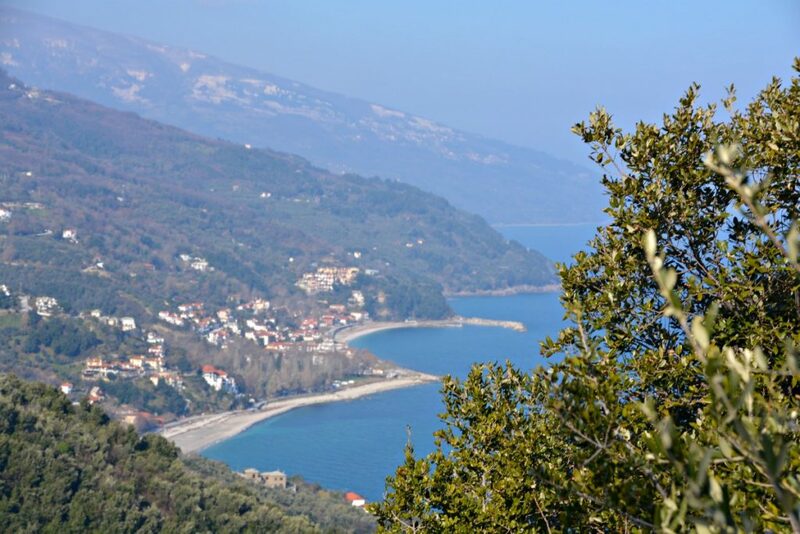 In case you missed it, read up on the Top 20 Things to Do in Pelion. 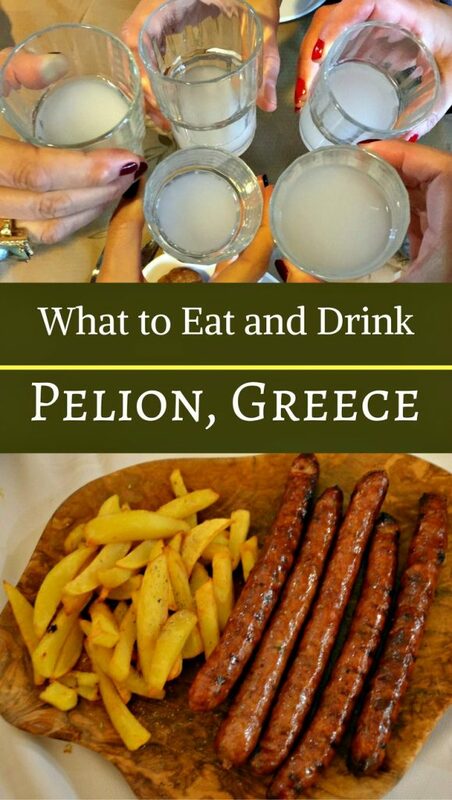 That sums up my advice about what to eat and drink in Pelion. I truly savored the delicious local foods here. 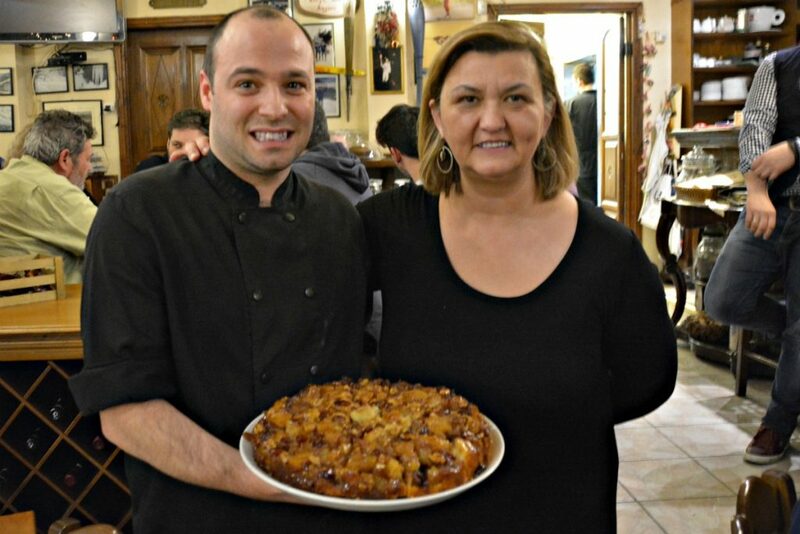 A very special gastronomy experience to have in Greece. 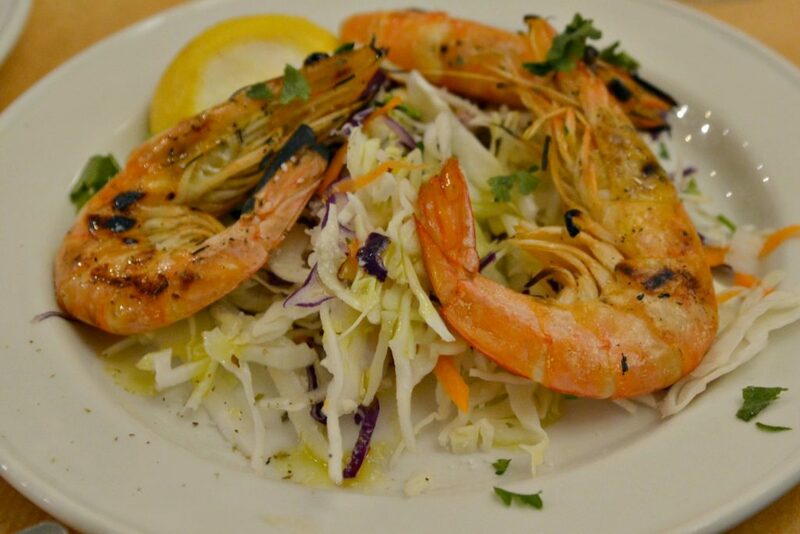 Have you ever dined in Pelion? Are there any foodie tips you would add to my list? Yummy! Great times and memories from Pelion! It really was a yummy trip, wasn’t it! Loved the food.